Moving beyond conventional accounts of gated communities and housing segregation, this book interrogates the moral politics of urban place-making in China’s commodity housing enclaves. Drawing on fieldwork and survey conducted in Shanghai, Pow critically demonstrates how gated communities are bound up in the cultural reproduction of middle-class landscape that is entrenched in the politics of the good life – defined in terms of a highly segregated landscape secured and maintained through the territorialisation of privilege, lifestyle and private property. The study challenges the concept of gated communities as simply ‘spatial containers’ of social classes and argues that Shanghai’s gated enclaves may be more fruitfully analyzed as critical sites of and for the production and consumption of an exclusive lifestyle where nascent middle-class sensibilities and identities are being (re)presented, cultivated and lived. In the final analysis, the book addresses an overarching normative concern by examining how social-spatial differentiation and exclusion in Shanghai’s gated communities potentially disrupt, challenge and unsettle the modern ideals of urban life. By adopting a geographical moral perspective, this book illuminates the moral complexities and ambiguities of place-making in Shanghai’s increasingly polarized urban landscape. 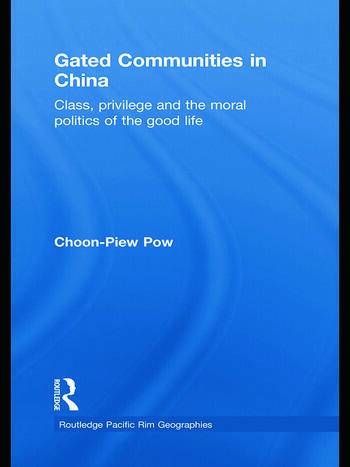 As the first book length academic study on gated communities in China, this book will appeal broadly to those with interests in Urban studies and urban social development in China. Pow Choon-Piew is Assistant Professor in the Department of Geography at the National University of Singapore.